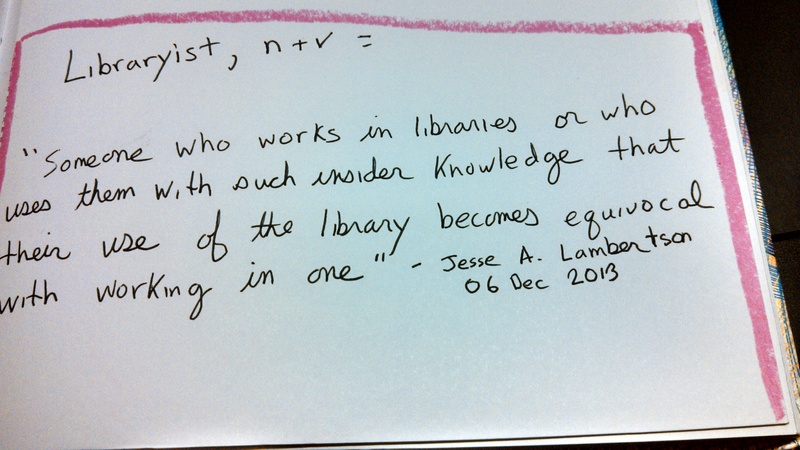 I am hereby coining a new term…that of “libraryist.” My Twitter handle, @jlibraryist, reflects this term already and I believe it can spread. The Oxford English Dictionary (OED) defines, “librarianship, n” as, “the office or work of a librarian” (accessed 06 Dec 2013). Not quite circular, but certainly vague. The OED defines “librarian, n” in two important ways: “The keeper or custodian of a library (This word has supplanted the older library-keeper)” and “a scribe, a copyist (Obs) (accessed 06 Dec 2013). I see these terms overlapping even though the use of “librarian” as copyist has fallen out. I consider this overlap because there is a notion of “librarian” as writer – as not only producing and managing information organization, cataloging schema, metadata for all formats and objects on shelves. It is as if the librarian exists as more than a keeper of items and records in all formats, but also as a producer of some of that same information. What do you think? I believe there is space here for a new definition. Of course my definition of “libraryist” will change over time as all definitions do – shown by just the two other terms, “librarianship” and “librarian,” in this post. No term is complete in either its definitions or understanding. For not only do definitions change, libraries also do. I am looking for a definition that encompasses as many spaces as possible – those other spaces of library use where we are as interested as thinking about libraries as we are about using their collections, resources and services. You can comment here or at Twitter. This entry was posted in librarianship, libraries, libraryist, social media and tagged librarianship, libraries, libraryist, social media, twitter.